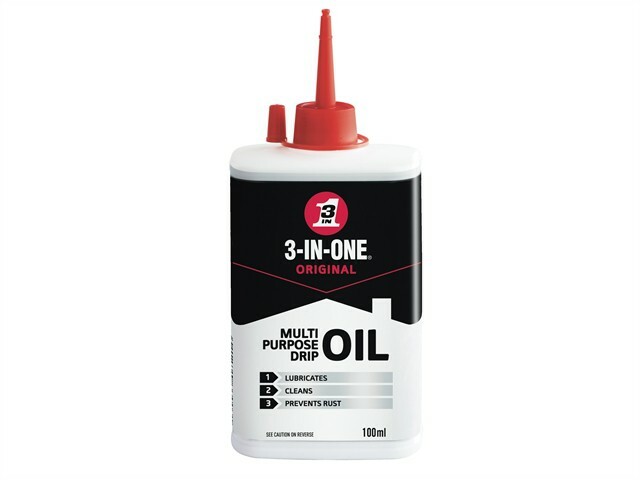 3-IN-ONE is a specially formulated lubricating, penetrating and cleaning oil. 3-IN-ONE's unique set of ingredients enable it to lubricate as well as protect metal surfaces, on nuts and bolts, hand and power tools, bearings, locks, fans, firearms, bicycles, rollers, wheels, drill bits, saw blades, ladders, seals, bearings, shafts, trailer hitches, skateboards, and moving parts...nearly everything that moves. Since 1894, 3-IN-ONE's versatile multi-purpose drip oil has been a trusted tool used by professional tradesmen and do-it-yourselfers to lubricate moving parts, penetrate rust, clean and protect tools, and much more. Its precise, easy-to-use drip spout enables precise application, with no overspray or splatter, and its updated packaging has a fill level indicator strip that shows you when you're running low. 3-IN-ONE oil can be used to lubricate tools, hinges, nuts and bolts, bicycles, wheels, fans and many other moving parts.